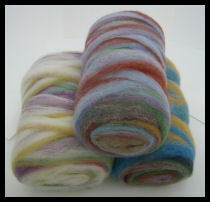 If you love to hand spin roving, these bumps are another way to package up loose roving, instead of loose in a large bag. Your cat might be disappointed, though, as it won't roll around on the floor. These bumps ship to you for less money as they are so much more compact. They also store very well in the closet that may be currently bursting open. The price is on top of our roving charges.